Last weekend I got TV. I mean, I own a TV, but it's only for watching DVDs. The only things I've watched in the past four years have been my movies and DVDs of PBS shows my dad has compiled for me. Some people have Netflix, I have Dadflix. Now I have an antenna and surfable channels. I've been doing a little relaxing from making art this week. Mostly it's been spent cleaning up the art hurricane that blew through my kitchen and living room last week, writing blog posts about The Strip, cooking, and flipping channels. I've seen some things I never want to see again, namely PBS's travel-nerd, Rick Steves, steam shirtless and get a massage complete with upper thigh slap at a spa in Germany. Yikes. Last night, I happened upon The Vikings. I found it late in the plot, but at the end it was basically Kirk Douglas sword fighting a one-handed Tony Curtis over the affections of Janet Leigh. Tony won, and Kirk sailed off into the sunset on a flaming, funeral pyre. What I saw was so-so, but the end credits were great. 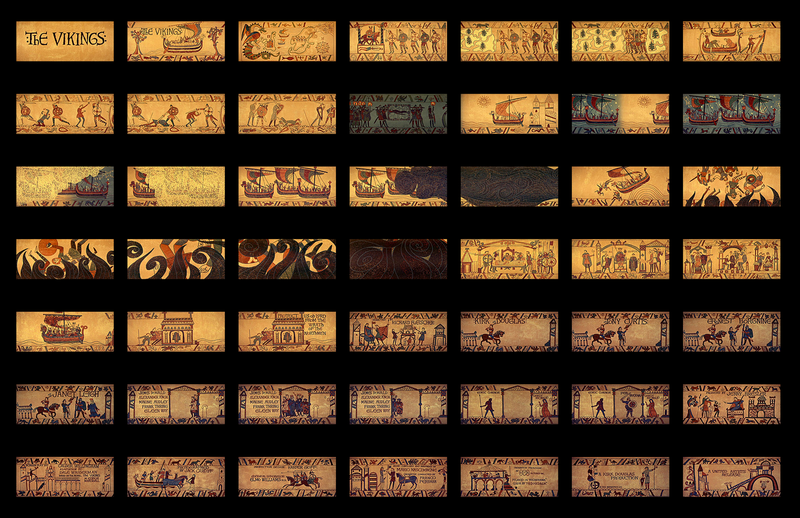 They were an animated version of the Bayeaux Tapestry. Check it out! You can also view a complete frame-by-frame image of the credits here.